Here we have the latest VAMO V7 with OLED displays! Very cool in its own right with its modular design. Can be used a mini with a single 18350 or a full size mod with either (2)18350's or a single 18650! Very cool indeed! 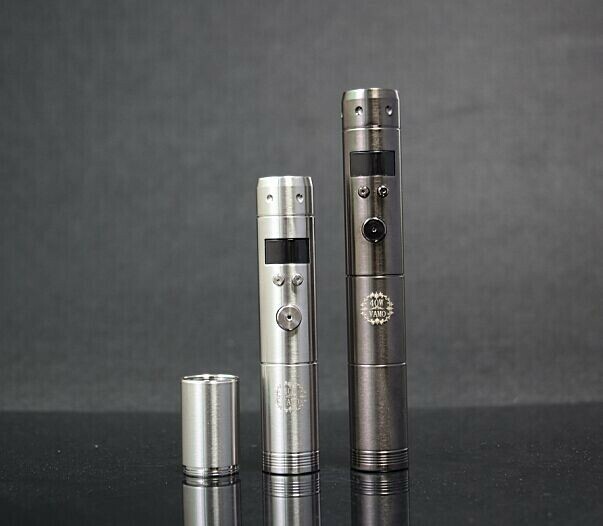 The V7 body is similar to the V5 with some logo changes but now has a new chip for 3W to 40W power and resistance down to 0.8ohm for sub-ohm vaping. Includes the same removable top cap from prior versions which is slightly slanted/beveled with pips. The V7 come in Black Gun Metal and Stainless. Users Manual included to describe basic functionality...but it doesn't get simpler than the Vamo! This Vamo is really perfect for me. I plan to use it at home mostly with an AGA-T2 (I just did my first succesful build!). The clouds of clean tasty vapor are soooo good. The RBA was a worth while challenge and I can dial in the PERFECT voltage on the Vamo depending on the resulting ohms of my coil and SS mesh build. The mod feels substantial, wellbuilt, and reliable. The threads are smooth, the screen is clear with nice little voltage, wattage, and ohmage symbols and it looks great with the AGA. The Vamo also really makes my T3's shine. The varible settings all work flawlessly and the interface is intuitive. Now all I need is a wi-fi connection on this thing and I'll be happy. ;) No. I've gone too far. I went ahead and ordered the kit with the 2 18650 batteries and charger. They seem to charge quickly and with casual use last up to 24 hours (minus the sleeping of course). Let's see, I purchased a drip-tip as well... ah yes the ming style 510. It's great. As Pbusardo says: "They remembered to put the hole in the middle. Thumbs up!" Is good. Oh it wobbles in the neck of the AGAT2 just a little, but since this is my first rig of this kind I couldn't say if that is unusual or not. Not much wobble. Not enough to bug me. I could probably slap another gasket on there and be all fixed up. I kind of like the whole DIY nature of the experience anyway. I would be remiss if I didn't emphasize the speedy delivery. Varitube shipped my order lickety-split and and Post Master McFeeley delivered it to my eager vape-box promptly. I am a Very Happy Camper. *puff *puff *puff ... . In Love with My Vamo 2 and this site! Thanks for incredibly fast shipping (along with USPS). Lost my Vamo V2 and like the V5 even better. Screen size is a bit small for my 5O yr. old eyes, but function is great. Works great! I wanted to give the vamo some time, so it has been roughly 2 weeks since I have received the Vamo. I had started with 808 stix and moved my way to the 808 ego, and then stepped up to the 808 DAV, This is my first 510 threading and vv/vw device. As you can see I have gone steps up and am glad because I can appreciate this AWESOME pv. It is simple to use to someone who has watched the video's out there to set. Once it is set in RMS and wattage you rarely change the wattage, and I never mess with the voltage. This came with the newer spring and am totally thrilled to use this as my all day pv. With the 18650 the Vamo lasts be a day and more than half of the next depending on how much I vape during the day. It is heavier than your typical ego, lava tube, twist/spinner/dav. But I like that. It fits well in my girlie hands, the button is easy to push, simple on and off 5 click button. I Love the Vamo! For the Seller..AWESOME! Friendly, personable, gave me updates for when the Vamo was due in, when it would be shipped and when it did ship. I will def. be back and def. buy again with confidence :D Thanks so much for a great sale! Just received my VAMO V%. What a great MOD. I have been vaping on it since receiving it and it is just as advertised. Vapetube is the bomb. Super fast shipping and handeling, best prices around and great service. Will be happy to order from again. I know they shipped quick and can't blame the delay in receiving as we had a rare ice storm and the mail did not move. Wonderful. Thanks again. Yes indeed, this is a big, heavy unit, but I HAD to have something that runs on a bigger battery because I was changing batteries six times a day & getting really, really tired of it. It is my "I will never smoke another analog again ever" insurance policy & is VERY important to me. USPS took extra days to get it to me & Perry had the patience of Job in dealing with my freaked impatience - my old one was failing & I was really panicking. Now it's here and my overall impression is this thing is extremely well built & functions flawlessly - I am very thoroughly impressed. I use my Boge F16s and Protanks on it and they work like they were made just for the Vamo. Power-wise I tried it all 3 ways with the 18650 & 18350s & it is bullet proof! Love the range of control! So glad I didn't waste a fortune on a Provari now - the operation & feel is on par with the more expensive units & the price was awesome! I might buy another one to have a spare! Thank you Perry! You're the greatest! If you people even think about ordering from somebody else you're crazy! Ordered my V7 literally the day Varitube updated the website and added them.. Was about to grab a more expensive V6 elsewhere so VT came through just in time and it was even the Deal of the Day haha! Got here SUPER quick, and has been vaping STRONG for over a month now! Tried hitting 20 and 30w a couple times but boy do NOT do that with a Kayfun Lite haha.. Love the fact itll take stacked 18350s.. My pair of purple Efests last me well over a day in this thing.. Love it Varitube!! Been vaping forever and this is the best device I have purchased.Taking it to the next level. Shipping was the fastest ever 36hrs. Extremely satisfied. Also I searched online for the cheapest price and no one came close, ot even in China. I bought the Vamo V5 stainless steel and couldn't be happier. The only thing that bugged me was a gap between the top cap and my tanks. To fix this I just used a ego beauty ring with all my 510 tanks and raised it just above the threads. I was very happy with how quick I received my package and the prices here are great too. I didn't really hear too much about Varitube.com on the forums but I must say they will def. be getting my business in the future. Received my vamo in 2 days...super fast delivery..all I can say is wow, I should have got one sooner. I have been vaping for 3 and a half years now. Went from 2 packs of cigarettes a day to vaping only. Thanks Varitube. Excellent service. AMAZING EQUIPMENT, CUSTOMER SERVICE AND QUALITY!! I went from an Ego to the Vamo and its the best decision I've never made! I did get a Venus to go with the Vamo but even with a normal clearomizer, it still blows the ego out of the water. Don't believe me, ask Perry himself! Definitely worth the extra money! It's a PV that works exactly as described. It produces a solid vapor, the buttons are "clicky" and the menu is easy to use. More importantly Varitube is one of the better vendors I do business with and I use several online stores. Their pricing is extremely aggressive and the customer service is a 10. I ordered my V7 and was using it three days later, the shipping was insanely fast. I've used them often and have always been pleased with the pricing and service! This is the best price you will find! Spent countless hours pricing the Vamo on other sites and the only ones I found cheaper were in China, and I think they deliver by helicopter because my Vamo was here in two days! This is my 1st Mod and it is awesome, very sturdy and no rattles like some reviewers report with a single 18650 battery. This device has changed my life and I am never going back to analogs! I wanted to wait and give my Vamo a few weeks of use before I wrote a review, but I couldn't be happier. It's just as good as everyone says they are. It is built out of high quality parts and is very sturdy. If you're on the fence about buying one, just go for it, it finally got me to quit smoking cigarettes thankfully. I was slightly skeptical but am fully satisfied and have already recommended this to multiple people. Shipping was very fast, I had it within 2 days of the shipping date. 5 stars awesome product! After buying several Vamos from different vendors and finding out that nobody actually makes the vamo, I figured I'd take a chance on this site and test their "version" because at least it purports to have a company name (KSD). So far, this "version" is working exactly as expected without any of the smushy button issues that the other so-called Vamos have. This one, and the one I bought from 1 other place in Florida are the only two that haven't crapped out. So, moral is, Varitube is where I'll go for my Vamo. Good job selling good stuff. I have been Vaping for two years and have to say this device is awesome. Works perfect and the price is the best deal around for VV and VW. Super easy to adjust settings. I would suggest getting a wrap unless you like to see your finger prints. Great apv.